It's 3 weeks to CNY! Have you started on your shopping for CNY goodies? One must buy during this festive period is Bak Kwa! 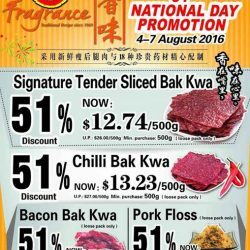 If you love this dried barbequed meat, dun miss the factory sales by Fragance Bak Kwa and Bee Cheng Hiang! 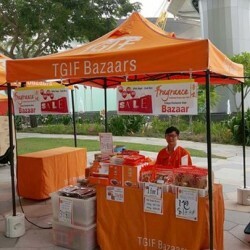 Enjoy their bazaar at Changi City Point from today to this friday from 11am to 9pm daily. 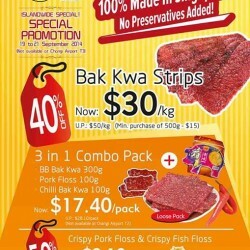 Different products ranging from vacuum packed bak kwa to tidbits, selling at promotional price. To find out more. 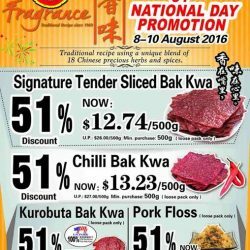 Enjoy Fragrance Foodstuff offers for 7th Month Islandwide Promotion for these 3 days only! 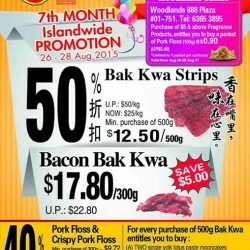 and Save 50% when you purchase at least 500g of their delicious Bak Kwa Strips! Their yummy Bacon Bak Kwa is selling at $17.80 / 300g with a min of 300g. Last but not least, their Pork Floss & Crispy Pork Floss is selling at 40% with a min purchase of 300g. Terms & Conditions apply. 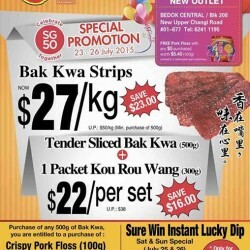 Save $23.00 / kg when you purchase our delicious Bak Kwa Strips from now until this coming Sunday. Can't get enough? 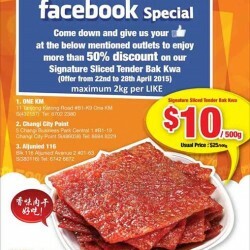 They have a special $22 Combo deal for 500g Signature Sliced Tender Bak Kwa together with Kou Rou Wang. Lastly, they will be having a Sure Win Instant Lucky Dip @ IMM and Westgate on this weekend. Terms and Conditions apply. Enjoy this special promotion from 22nd to 28th April 2015 for selected outlets if you LIKE their FB page now! Share the news and get your friends to LIKE them too! Terms & Conditions apply. 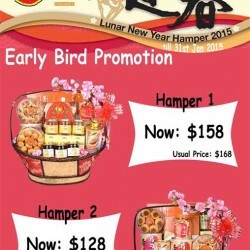 Dear Fans, Fragrance Foodstuff have early bird promotion for their Fragrance Prosperous hampers from now till end of January 2015. (Not available at Changi Airport T3). Fragrance Islandwide Special Promotion for 40% off starts from today till 23th Nov 2014! Islandwide Special Promotion starts from today till 19th Oct 2014! 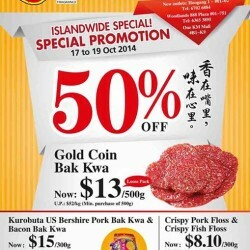 Our Gold Coin Bak Kwa are selling at 50% discount with a min. purchase of 500g. 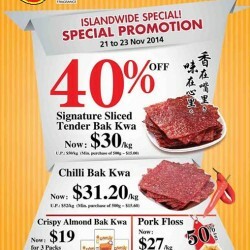 Islandwide Promotion starts from today till 12th Oct 2014! 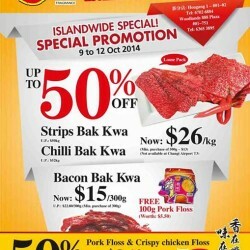 Our Spicy Chilli Bak Kwa and Tasty Bak Kwa Strips are selling at 50% discount with a min. purchase of 500g. (Not available at Changi Airport T3). Special Promotion till 6th Oct 2014! 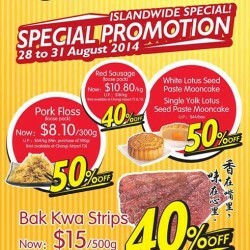 Fragrance Foodstuff is having a Islandwide Special Promotion starts today till 21st Sep 2014! Bak Kwa Stripes at $30 / kg with a min. purchase of 500g. (Not available at Changi Airport T3). New 3 in 1 Combo Pack at $17.40 / pack. It includes our BB Bak Kwa 300g, Pork Floss 100g and Chilli Bak Kwa 100g. (Not available at Changi Airport T2 and T3). 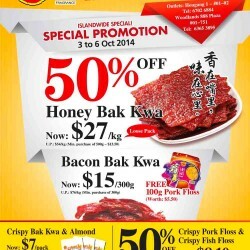 Crispy Pork Floss and Crispy Fish Floss (loose pack) at 50% off with a min. purchase of 300g. (Not available at Changi Airport T3). Fragrance's Islandwide Special Promotion starts today till 31st Aug 2014! 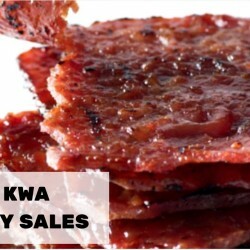 Bak Kwa Stripes are selling at $30 / kg with a min. purchase of 500g. (Not available at Changi Airport T3). Pork Floss (loose pack) is selling at 50% off with a min. purchase of 300g. (Not available at Changi Airport T3). Red Sausage (loose pack) is selling at 40% off with a min. purchase of 500g. (Not available at Changi Airport T2 and T3). White Lotus Mooncake and Single Yolk Lotus Mooncake at 50% off. 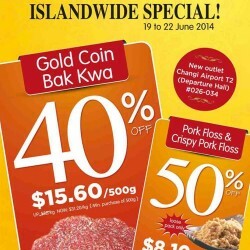 Fragrance Foodstuff is offering islandwide special deal from 19-22 Jun. 2014.